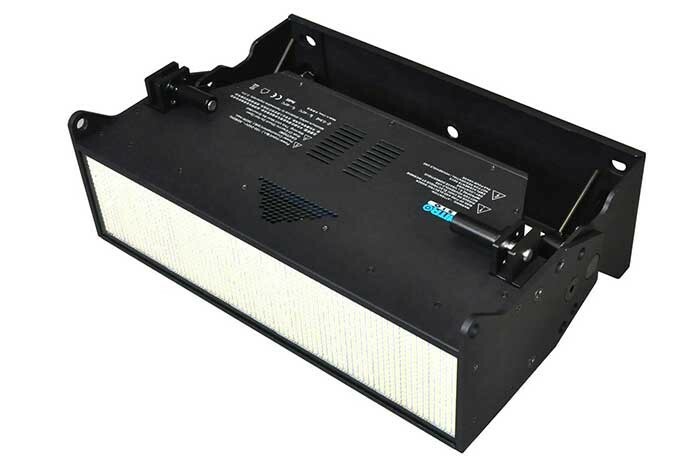 Philips Entertainment has announced that Showline SL NITRO 510 LED Strobe luminaires are now shipping worldwide. Following their successful debut at Prolight + Sound 2013, the SL NITRO 510 is a cutting-edge, LED- based strobe that provides intense bursts of light and dynamic effects with over 1300 high-powered LEDs. To ensure maximum performance and an even distribution of light throughout your performance, the SL NITRO 510 also includes features such as continuous-on and continuous full strobe capabilities making it a truly revolutionary strobe luminaire unlike any seen before. "The SL NITRO 510 is extremely unique and more versatile than any other strobe currently on the market," began Brad Schiller, Showline Product Marketing Manager. "It uses less power than traditional strobes, yet is extremely bright at over 68,000 lumens. It also has six programmable zones to create a multitude of looks and it can be used as a featured light source through the continuous duty cycle where the LEDs can be on at full for nearly unlimited amounts of time without any loss in output." Currently in-stock at rental companies such as Neg Earth in the United Kingdom, SL NITRO 510 LED luminaires include a built-in quick-connect system that allows them to easily connect together in both horizontal and vertical orientations. The connection pins lock fixtures together while maintaining a perfect pixel pitch alignment of each fixture’s six programmable zones. Additionally, to ensure they fit perfectly into the Showline family, SL NITRO 510 luminaires can quickly connect with SL BAR 520 luminaires to provide total creative flexibility to any lighting design. When the units are combined, both the pixels of the SL BAR 520 and the zones of the SL NITRO 510 align allowing symmetry and unlimited design possibilities. Schiller concluded: "With its tightly-packed array of high-power LEDs, the SL NITRO 510 is an LED strobe light built to be a strobe light, and the innovative quick-connect feature allows unprecedented freedom of design. As more luminaires continue to make their way into our Authorized Dealerships worldwide, we are excited to experience the new and interesting applications that entertainment lighting designers around the world can now create with the SL NITRO 510 LED Strobe."